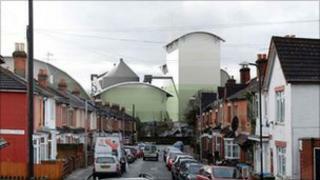 A Southampton MP has said proposals to build a £300m biomass power station in the city should be rejected. Dr Alan Whitehead, Labour MP for Southampton Test, said the planned plant at Millbrook was "unworkable". Helius Energy wants to build and operate the wood-fired power station on a site within the Western Docks. Instead of the application being determined by the city council, the final decision will be made by the Infrastructure Planning Commission. The commission is responsible for examining applications for nationally significant infrastructure projects. Mr Whitehead said: "The location of the station and its size just makes the current proposals unworkable. I'll be telling the planning commission they should instead explore alternative sites in more appropriate locations." Councillors at the Conservative-led Southampton City Council have also vowed to fight the scheme, which would be built 125m from a residential area. Residents living in nearby streets are worried the plant and its 100m (328ft) chimney will overshadow their homes and affect property values. They have set up a website and Facebook page to co-ordinate the campaign. Protests are planned on Wednesday and Saturday. Helius Energy is holding more public exhibitions about the plans, the next of which is at Marchwood Village Centre between 1400 and 1930 GMT on Wednesday. Details of four other exhibitions can be found on the Southampton Biomass Power website. The firm says the 100 mega watt plant would generate enough electricity to power 200,000 homes and produce 720,000 tonnes less carbon each year than a similar sized coal-fired power station. The firm said it would also create between 53 and 450 jobs during construction and about 40 permanent full-time jobs once complete. If approved, construction of the plant would begin in 2012.